（WBSC，October 12, 2016）　IWAKI, Japan — A new baseball fun zone has been installed adjacent to Iwaki Green Stadium for children and fans of all ages in Fukushima Prefecture to train and try their baseball skills. The region continues to rebuild and make forward progress following the devastating Great East Japan earthquake that struck in 2011. 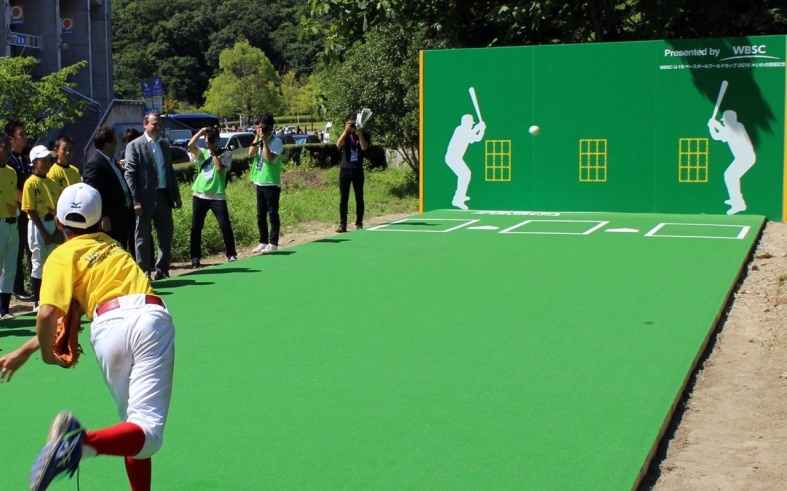 The new baseball area was provided to the community by WBSC as part of the ongoing recovery efforts and as part of the post-event legacy of the flagship PREMIER12® 2015, which was staged in Japan and Taiwan last November. The U-15 Baseball World Cup 2016 Iwaki was also taken to the affected area to help raise awareness of the rejuvenated region and its offerings. The fun zone, which is valued at $US 100,000, was officially handed over to Iwaki City Mayor Toshio Shimizu during a press gathering, with several local youngsters inaugurating the playground. The new attraction, which is free and open to the public, can be used for urban baseball games, training sessions and introductory activities. The zone includes synthetic turf, a backstop with targets, batter’s boxes and three (children, teen and adult) marked pitching distances.